Our lab currently has two tool development projects. Please click on the links below to view both! One of our main research goals is to develop tools in order to observe Zn2+ in living cells. Our lab makes genetically-encoded, Förster resonance energy transfer (FRET) based sensors of Zn2+. Our sensors consist of two fluorescent proteins (FPs) linked by a Zn2+-binding domain. The sensors have different conformations in their Zn2+-bound and Zn2+-free forms. Because the distances and orientations of the two FPs relative to each other changes in the bound and unbound states we can detect FRET changes that correlates to the concentration of labile or ‘free’ zinc in the sensor’s environment. The advantages of our sensors are that they detect zinc in a ratiometric way that does not perturb the native free zinc in the cell. They are designed to be modular and tunable, and they can be targeted to different organelles. Unlike small molecule dyes, different concentrations of our sensors do not seem to deplete the ‘free’ zinc pool in cells (Figure 2A). The FPs that make up the FRET pair in the sensors can be changed to create different colored sensors or sensors with enhanced dynamic range. 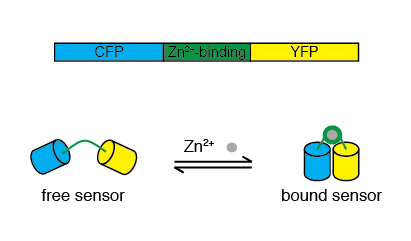 In addition, the zinc binding domains can be swapped to create sensors with various affinities (Figure 2B). Using various small peptide signaling sequences, we can localize the sensors to various organelles (Figure 2C). By optimizing the various aspects of the sensors, we continue to develop a robust and diverse toolset for studying the biology of zinc. Figure 2. A) Zinc pool depletion with one of our sensors (ZapCY2) compared to that with a commercially available small molecule dye (FluoZin3). B) Zinc sensors with different zinc binding domains have different Kds and therefore percent saturation within the same compartment in the cell. C) Zinc sensors localized to different organelles within the cell. The main goal of this project is to develop assays to study the mechanics of host-pathogen interactions at the single cell level in live cells over the course of infection. We are interested in understanding the cell biology of infections by human pathogens such Salmonella enterica and Listeria monocytogenes. Previous project goals have been to use tools and image analysis techniques developed in our lab to track key bacterial virulence factors involved with the formation and maintenance of the bacterial niche during infection. Our main current project objective is to develop tools to visualize RNA within the context of bacterial infection. Live epithelial cells infected with fluorescent Salmonella display effector protein localization with the Split-GFP system developed in our lab. Image by Sarah McQuate. Carter, K.P., Carpenter, M.C., Fiedler, B., Jimenez, R. & Palmer, A.E. Critical comparison of FRET-sensor functionality in the cytosol and endoplasmic reticulum and implications for quantification of ions. Analytical Chemistry 2017. Qin, Y., Sammond, D.W., Braselmann, E., Carpenter, M.C. & Palmer, A.E. Development of an optical Zn2+ probe based on a single fluorescent protein. ACS Chemical Biology 2016, 11(10):2744-51. Qin, Y., Miranda, J.G., Stoddard, C.I., Dean, K.M., Galati, D.F. & Palmer, A.E. Direct comparison of a genetically encoded sensor and small molecule indicator: Implications for quantification of cytosolic Zn2+. ACS Chemical Biology 2013, 8(11):2366−71. Miranda, J.G., Weaver, A.L., Qin, Y., Park, J.G., Stoddard, C.I., Lin, M.Z. & Palmer, A.E. New alternately colored FRET sensors for simultaneous monitoring of Zn2+ in multiple cellular locations. PLoS ONE 2012, 7(11):e49371. Park, J.G., Qin, Y. Galati, D.F. & Palmer, A.E. New sensors for quantitative measurement of mitochondrial zinc(II). ACS Chemical Biology 2012, 7(10):1636-40. Qin, Y., Dittmer, P.J., Park, J.G., Jansen, K.B. & Palmer, A.E. Measuring Steady State and Dynamic ER and Golgi Zn2+ with Genetically Encoded Sensors. Proc. Nat. Acad. Sci. USA 2011, 108(18):7351-6. Dittmer, P.J., Miranda, J.G., Gorski, J.A. & Palmer, A.E. Genetically encoded sensors to elucidate spatial distribution of cellular zinc. Journal of Biological Chemistry. 2009, 284(24):16289-97. Braselmann, E., Wierzba, A.J., Polaski, J.T., Chromiński, M., Holmes, Z.E., Hung, S.T., Batan, D., Wheeler, J.R., Parker, R., Jimenez, R., Gryko, D., Batey, R.T. & Palmer, A.E. A multicolor riboswitch-based platform for imaging of RNA in live mammalian cells. Nature Chemical Biology 2018. In press. Batan, D., Braselmann, E., Minson, M., Nguyen, D.M.T., Cossart, P. & Palmer, A.E. A Multicolor Split-Fluorescent Protein Approach to Visualize Listeria Protein Secretion in Infection. Biophysical Journal 2018, 115(2):251-262. Young, A.M., Minson, M., McQuate, S.E. & Palmer, A.E. Optimized fluorescence complementation platform for visualizing Salmonella effector proteins reveals distinctly different intracellular niches in different cell types. ACS Infectious Diseases 2017, 3(8):575-84. McQuate, S.E., Young, A.M., Silva-Herzog, E., Bunker, E., Hernandez, M., de Chaumont, F., Liu, X., Detweiler, C.S. & Palmer, A.E. Long-term live cell imaging reveals new roles For Salmonella effector proteins SseG and SteA. Cellular Microbiology 2016, 19(1):e12641. Stavru, F., Palmer, A.E., Wang, C., Youle, R.J. & Cossart, P. Atypical mitochondrial fission upon bacterial infection. Proc. Natl. Acad. Sci. USA 2013, 110(40):16003–8. Van Engelenburg, S.B. & Palmer, A.E. Imaging type-III secretion reveals dynamics and spatial segregation of Salmonella effectors. Nature Methods 2010 7(4):325-30. Van Engelenburg, S.B., Nahreini, T. & Palmer, A.E. FACS-based selection of tandem tetracysteine peptides with improved ReAsH brightness in live cells. Chembiochem 2010, 11(4):489-93. Van Engelenburg, S.B. & Palmer, A.E. Quantification of real-time Salmonella effector type III secretion kinetics reveals differential secretion rates for SopE2 and SptP. Chemistry & Biology 2008, 15(6):619-28.